New Delhi, March 25: Over the last 12 editions of the Indian Premier League, there havent been too many times when Delhi have gone into a game against Chennai Super Kings with a fair chance of competing. 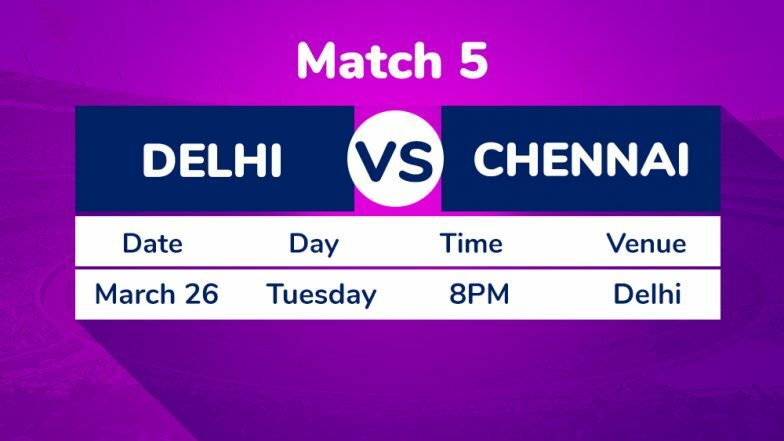 But come Tuesday at the Ferozeshah Kotla here, it will be a battle of equals for the first time as both team started off with convincing wins in their opening matches of the season. This is a new Delhi and just like they have a new name -- from Delhi Daredevils to Delhi Capitals -- the boys also showed what they are capable of on the field as they thrashed Rohit Sharma's Mumbai Indians by 37 runs in their opening match at the Wankede Stadium on Sunday. VIVO IPL 2019: Delhi Capital's All-Round Performance Helps Beat Mumbai Indians by 37 Runs at Wankhede Stadium. Defending champions CSK too had a brilliant start to their campaign when they beat Virat Kohli's Royal Challengers Bangalore by 7 wickets on a Chepauk wicket that had even M.S. Dhoni calling for more sporting wickets. The turner at the MA Chidambaram Stadium saw Royal Challengers Bangalore (RCB) fold up for 70 and CSK chased it down with two overs in the bag. CSK vs RCB IPL 2019 Stat Highlights: Harbhajan Singh, Imran Tahir Shine as Chennai Super Kings Registers Convincing Win. Speaking after the win over RCB, Dhoni had said that Harbhajan's role in the team will be quite floating and he will be played on and off depending on the conditions. So clearly, a look at the wicket will be must before CSK decide on the playing XI for their second game. In the bowling department too, it was an all-round show as Ishant Sharma (2/34) and Kagiso Rabada (2/23) led the show with the spinners chipping in with vital wickets. Axar Patel's figures could be a bit of a worry as he gave away 42 runs from his three overs, but it is still early days in the season and DC will hope that he settles down soon.